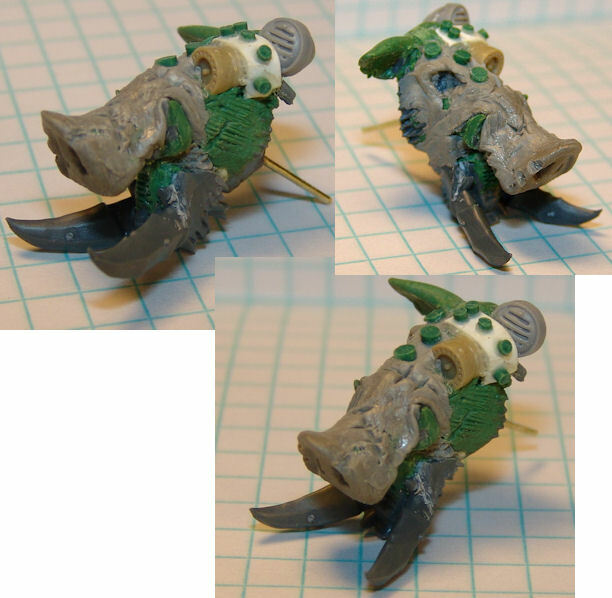 Due to some unavoidable medical issues (that's what I get for my Nurgle worship), progress hit a bit of a speed bump on the Warpig. But I have got a few things done. I started blocking in the body and put the basic neck together. 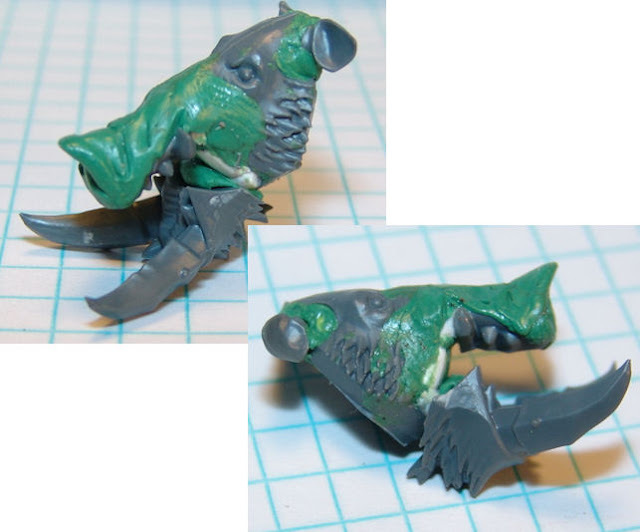 I still need to build the neck up a bit to give him the "ridgeback". A face only a mother could love.... or an ork. Here's a basic dryfit of the components as they are so far. Have the next few days off (for healing) so there'll be another update Wednesday or Thursday. Possibly some sketches or Chaos stuff as well. The Warp....it calls to me. On a slightly unrelated note, I just finished "Know No Fear" by Dan Abnett. If you are a fan of the Horus Heresy series or just like great storytelling from the grimdark future, THIS is one awesome book. The images this book conjures of a planetary assault and the way he delivers the suprise attack on Calth, is masterful. But then again, I'm a bit of an Abnett fanboy. Worth a look. 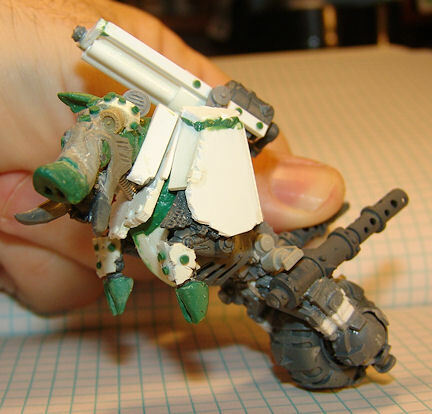 The Warpig of the Aporkalypse: Exhausts! 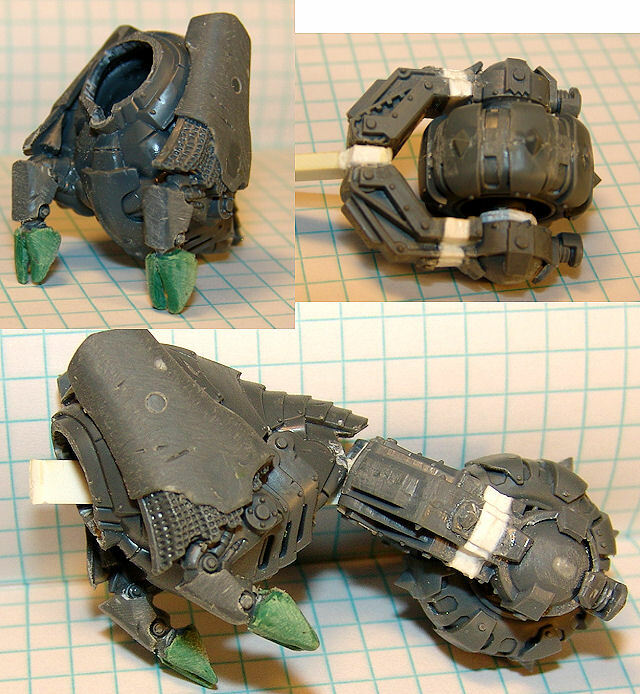 More progress on the warpig. I'm calling the head/face done. Now comes the task of marrying it to the body. And here's the work on the body. Basic exhausts ('borrowed" from a couple of Trukks over at Gorhakk's motorpool.... no one will miss 'em :) ) The front shins are re-armored. The plan is to do that with the rest of the body, build it up. Ramshackle it. Still have to work on the controls and the maniac rider. The pic on the bottom right is how it will be sitting on the base. That's all for now, more probably this weekend. 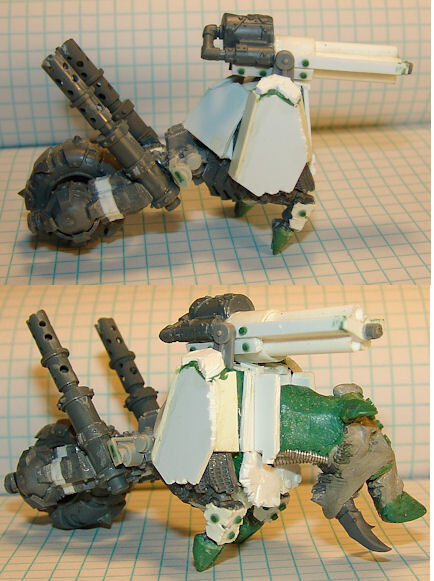 Warpig of the Aporkalypse: GUNZ!!! More work on THE PIG. First, more sculpting on the head. And a Barry shot with a Nob and all the components.... to give you scale. That's all for now. Keep a weather eye open ye snotgrubs! Cheer's Ya'll! 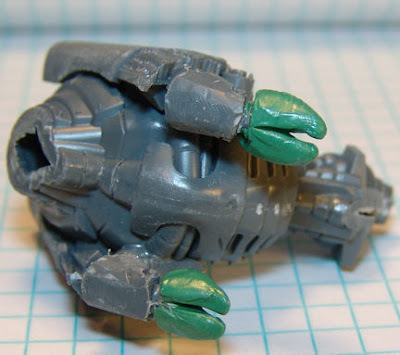 Warpig of the Aporkalypse: The Wheel is a'Rollin'! Lots of sweat driven progress today, waiting for the A/C guy to get us straightened out. The body is starting to take form. I'm big on having a basic idea and letting the build evolve along the way. I figure if there is any method to Orky madness, its likely a VERY organic process. 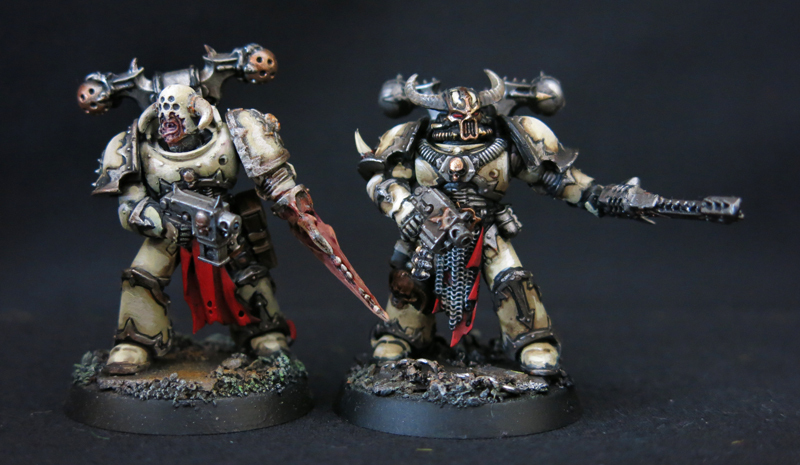 So, much to my suprise, the bloodcrusher has been hacked up pretty good so far. And there is still more to come. Lots of "Orkifyin'" to be done yet. Also have gotten the rear wheel assembly straightened away. Still not sure how its all going to get together.. dakka-gatling gun and control panel, then rider. But here's the mock up...OH....and the piggy hooves. THEN... we have progress on the ugly mug. The basic assembly is done. A second layer of detail sculpting, bionic eye and some bolts. Still have to straighten away the mouth and the one natural eye, but I've rebuilt the eye socket and added some scars. Eventually, It'll go on the front end. Lots of hair, lips and such to add yet. 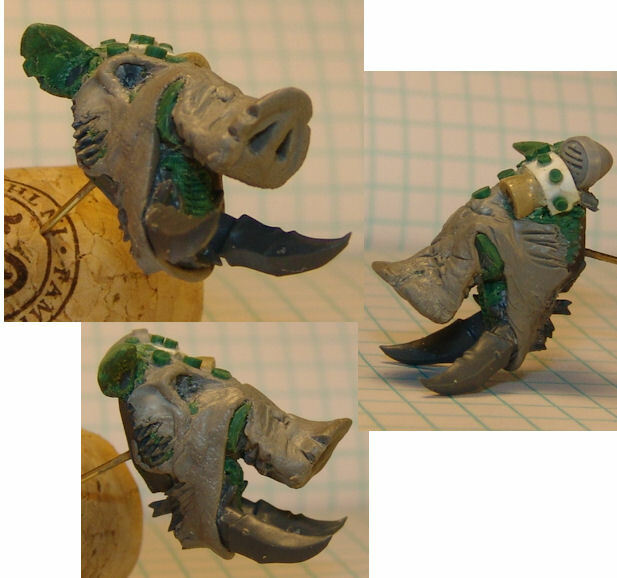 Some sculpting progress on the Warpig. I took a stock pig head and started cutting. I've lengthened the snout, forehead and jaw, so far. Basically plan on using the stock pighead to build on, since the warpig needs to be bigger and mechanized. Still very much in progress. He's gonna be vicious and ugly. On the other side of the pig, I split the blood crusher hooves and put some putty on for the basic shape of the piggy hoofs. The ones below will get some cutting ad shaping once it has cured more. My A/C is down tonight(in Florida that's not always fun), so I might get more done, since sleep is not likely. I've been spoiled for too long, kind of forgot what it was like without air conditioning. Though thoroughly distracted by my shiny new 6th Edition rulebook and Civilization V:Gods and Kings, I have gotten something done aside from tinkering with Necrons. 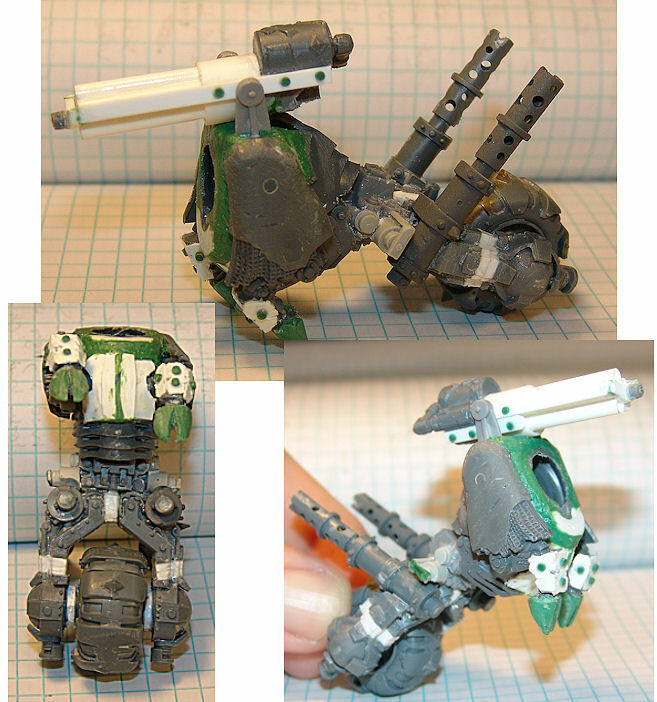 I'll post some sketches of the final concept, but here are the humble beginnings of the "Warpig uv da Aporkalpse!"... my Wazdakka stand-in. Picture if you will: A big ugly pig head with various cybornetic pipes,cables etc. 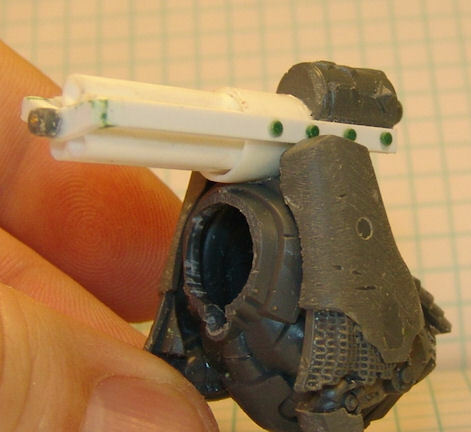 The front shoulder area will all be ramshackle armoured in and housing a 3 barreled gatling gun. 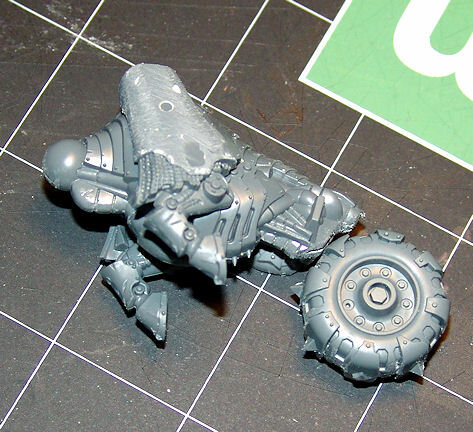 The truck tire will be attached bike style (or something like that) with appropriate exhaust pipes. 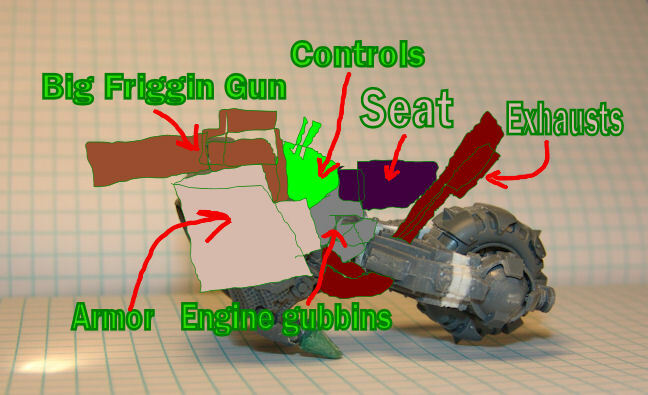 The control knobs,levers,buttons will be above the shoulders... along with a hand crank for the cannon and a bar for the rider to hold on to. SO...alot of work ahead. But.... just imagine the pure ORKY coooooooolness!